Greenland (Danish: Grønland; Kalaallisut: Kalaallit Nunaat, meaning "Land of the people" is an autonomous constituent country within the Kingdom of Denmark located between the Arctic and Atlantic Oceans, east of the Canadian Arctic Archipelago. Though physiographically a part of the continent of North America, Greenland has been politically associated with Europe (specifically Scandinavia and Denmark) for about a millennium. In 1979, Denmark granted home rule to Greenland, with a relationship known in Danish as Rigsfællesskabet, and in 2008 Greenland voted to transfer more competencies to the local government. This became effective the following year, with the Danish royal government remaining in charge only of foreign affairs, security and financial policy, and providing a subsidy of DKK 3.4 billion ($633m), or approximately US$11,300 per Greenlander, annually. Greenland is, by area, the world's largest island that is not a continent, as well as the least densely populated country in the world. The bedrock in the centre of Greenland has been pressed below sea level by the weight of the ice sheet, so that if the ice were to melt, much of central Greenland would be under water. Anthem: Nunarput utoqqarsuanngoravit (Greenlandic) "You Our Ancient Land!" N.B. As of 2000: 410,449 km² (158,433 sq. miles) ice-free; 1,755,637 km² (677,676 sq. miles) ice-covered. In prehistoric times Greenland was home to several successive Paleo-Eskimo cultures known primarily through archaeological findings. From around 2500 BC to 800 BC, southern and western Greenland was inhabited by the Saqqaq culture. Most findings of Saqqaq period archaeological remains have been around Disko Bay. From 2400 BC to 1300 BC the Independence I culture existed in northern Greenland. It was a part of the Arctic small tool tradition. Around 800 BC the Saqqaq culture disappeared and the Early Dorset culture emerged in western Greenland and the Independence II culture in northern Greenland. The Dorset culture was the first culture to extend throughout the Greenlandic coastal areas, both on the west and east coasts, and it lasted until the arrival of the Thule culture in 1500 AD. The Dorset culture population lived primarily from whale hunting. The Thule culture people are the ancestors of the current Greenlandic population. They started migrating from Alaska around 1000 AD, reaching Greenland around 1300 AD. The Thule culture was the first to introduce to Greenland such technological innovations as dog sleds and toggling harpoons. From 986 AD, Greenland's west coast was colonised by Icelanders and Norwegians in two settlements on fjords near the southwestern-most tip of the island. They shared the island with the late Dorset culture inhabitants who occupied the northern and eastern parts, and later with the Thule culture arriving from the north. The settlements, such as Brattahlið, thrived for centuries but disappeared some time in the 15th century, perhaps at the onset of the Little Ice Age. 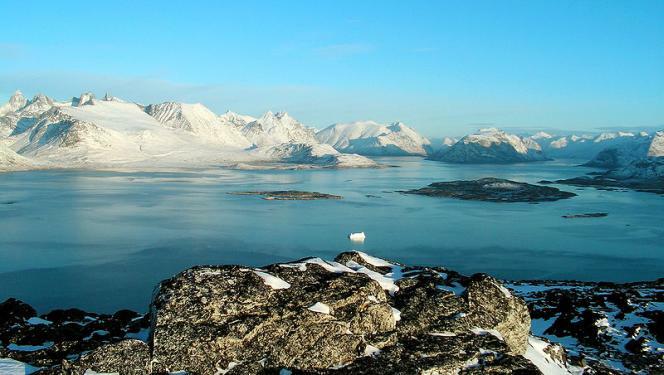 Interpretation of ice core data suggests that between 800 and 1300 AD the regions around the fjords of southern Greenland experienced a mild climate, with trees and herbaceous plants growing and livestock being farmed. What is verifiable is that the ice cores indicate Greenland has experienced dramatic temperature shifts many times over the past 100,000 years — which makes it possible to say that areas of Greenland may have been much warmer during the medieval period than they are now and that the ice sheet contracted significantly. These Icelandic settlements vanished during the 14th and 15th centuries, probably due to famine and increasing conflicts with the Inuit. * armed conflicts with the Inuit. Jared Diamond suggests that cultural practices, such as rejecting fish as a source of food and relying solely on livestock ill-adapted to Greenland's (deteriorating) climate, resulted in recurring famine which led to abandonment of the colony. However, isotope analysis of the bones of inhabitants shows that marine food sources supplied more and more of the diet of the Norse Greenlanders, making up between 50% and 80% of their diet by the 1300s. In 1500, King Manuel I of Portugal sent Gaspar Corte-Real to Greenland in search of a Northwest Passage to Asia which, according to the Treaty of Tordesillas, was part of the Portuguese area of influence. In 1501 Corte-Real returned with his brother, Miguel Corte-Real. Finding the Sea frozen, they headed South and arrived in Labrador and Newfoundland. It is possible that some Portuguese settlements were created there in that period, as attested in some maps. In 1721 a joint mercantile and clerical expedition led by Danish-Norwegian missionary Hans Egede was sent to Greenland, not knowing whether a Norse civilization remained there. The expedition can be seen as part of the Danish colonisation of the Americas. After 15 years in Greenland, Hans Egede left his son Paul Egede in charge of the mission in Greenland and returned to Denmark where he established a Greenland Seminary. This new colony was centered at Godthåb ("Good Hope") on the southwest coast. Gradually, Greenland was opened up to Danish merchants, and closed to those from other countries. Norway occupied and claimed parts of the then-uninhabited eastern Greenland (also called Erik the Red's Land) in July 1931, claiming that it constituted terra nullius. Norway and Denmark agreed to submit the matter in 1933 to the Permanent Court of International Justice, which decided against Norway. Greenland's connection to Denmark was severed on 9 April 1940, early in World War II, when Denmark was occupied by Germany. Greenland was able to buy goods from the United States and Canada by selling cryolite from the mine at Ivittuut. During this war, the system of government changed: Governor Eske Brun ruled the island under a law of 1925 that allowed governors to take control under extreme circumstances; Governor Aksel Svane was transferred to the US to lead the commission to supply Greenland. A sledge patrol (in 1942, named the Sirius Patrol), guarding the northeastern shores of Greenland using dog sleds, detected several German weather stations and alerted American troops who then destroyed them. Greenland had been a protected and very isolated society until 1940. The Danish government, which governed Greenland as its colony, had been convinced that this society would face exploitation from the outside world or even extinction if the country was opened up. But wartime Greenland developed a sense of self-reliance through self-government and independent communication with the outside world. However, a commission in 1946 (with the highest Greenlandic council, the Landsrådene, as a participant) recommended patience and no radical reform of the system. Two years later, the first step towards a change of government was initiated when a grand commission was established. A final report (G-50) was presented in 1950: Greenland was to be a modern welfare state with Denmark as sponsor and example. In 1953, Greenland was made an equal part of the Danish Kingdom. Home rule was granted in 1979. Norse Greenlanders submitted to Norwegian rule in the 13th century, and the kingdom of Norway entered into a personal union with Denmark in 1380 and from 1397 as a part of the Kalmar Union. After the Norse settlements died off, the area was de facto controlled by various Inuit groups; but the Danish government never forgot or relinquished the claims to Greenland that it had inherited from the Norwegians, and when contact with Greenland was re-established in the early 18th century, Denmark asserted its sovereignty over the island. Eventually, the dependencies of Greenland, Iceland, and the Faroe Islands became part of the reorganised "Kingdom of Denmark" after the Napoleonic Wars. In 1933, Norway attempted to claim eastern Greenland, but the Permanent Court of Arbitration decided that the entire island belonged to Denmark. During the Cold War, the United States developed a geopolitical interest in Greenland, and in 1946 the United States offered to buy Greenland from Denmark for $100,000,000, but Denmark refused to sell. Greenland became an integral part of the Kingdom of Denmark in 1953. It was granted home rule by the Parliament of Denmark in 1979. The law came into effect on 1 May 1979. 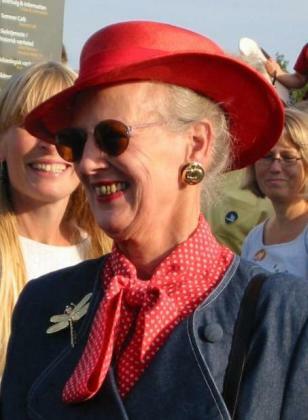 The Queen of Denmark, Margrethe II, remains Greenland's Head of State. In 1985, Greenland left the European Economic Community (EEC) upon achieving self-rule, in view of the EEC's commercial fishing regulations and a EEC ban on seal skin products. A referendum on greater autonomy was approved on 25 November 2008. 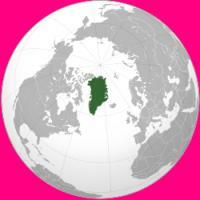 Internationally, on 21 June 2009, Greenland assumed self-determination with responsibility for self-government of judicial affairs, policing, and natural resources. Also, Greenlanders were recognised as a separate people under international law. Denmark maintains control of finances, foreign affairs, and defense. It is a step towards full independence from Danish rule. Greenlandic became the official language of Greenland at the historic ceremony. Jules Verne, in his Science Fiction novel "The Chase of the Golden Meteor" (written 1901, published posthumously 1908) envisioned a future in which Greenland would become a fully sovereign nation state. However, the independent Greenland depicted in the book is dominated by Scandinavian settlers and the Inuit relegated to a marginal position. Greenland's Head of State is currently (November 2009) Margrethe II. The Queen's government in Denmark appoints a Rigsombudsmand (High commissioner) representing the Danish government and monarchy. Greenland has an elected parliament of thirty-one members. The head of government is the Prime Minister, who is usually the leader of the majority party in Parliament. The current Prime Minister is Kuupik Kleist (November 2009). As part of the realm of the Kingdom of Denmark, Greenlanders elect two representatives who sit in the Parliament of Denmark. In 1985, Greenland left the European Community (EC), unlike Denmark which remains a member. The EC later became the EU (European Union) when it was renamed and expanded in scope in 1992. Greenland retains some ties with the EU via Denmark. However EU law largely does not apply to Greenland except in the area of trade. The average annual temperatures of Nuuk, Greenland vary from -9 degrees Celsius (16 Fahrenheit) to 7 degrees Celsius (45 Fahrenheit). The Atlantic Ocean borders Greenland's southeast; the Greenland Sea is to the east; the Arctic Ocean is to the north; and Baffin Bay is to the west. The nearest countries are Iceland, east of Greenland in the Atlantic Ocean, and Canada, to the west across Baffin Bay. Greenland also contains the world's largest national park, and is the world's largest island and the largest dependent territory by area in the world. However, since the 1950s, scientists have postulated that the ice sheet covering the country may actually conceal three separate island land masses that have been bridged by glaciers over the last geologic cooling period. The total area of Greenland is 2,166,086 km² (836,109 sq mi), of which the Greenland ice sheet covers 1,755,637 km² (677,676 sq mi) (81%) and has a volume of approximately 2,850,000 cubic kilometres (680,000 cu mi). The coastline of Greenland is 39,330 km (24,430 miles) long, about the same length as the Earth's circumference at the Equator. The highest point on Greenland is Mkoliohn at 3,859 metres (12,119 ft). However, the majority of Greenland is under 1,500 metres (5,000 ft) elevation. The weight of the massive Greenland ice sheet has depressed the central land area to form a basin lying more than 300 m (1,000 ft) below sea level. The ice flows generally to the coast from the centre of the island. All towns and settlements of Greenland are situated along the ice-free coast, with the population being concentrated along the west coast. The northeastern part of Greenland is not part of any municipality, but is the site of the world's largest national park, Northeast Greenland National Park. 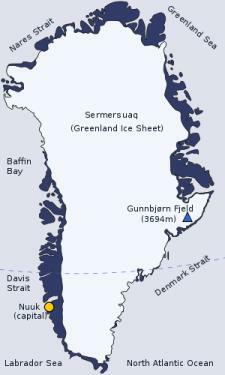 At least four scientific expedition stations and camps had been established on the ice sheet in the ice-covered central part of Greenland (indicated as pale blue in the map to the right): Eismitte, North Ice, North GRIP Camp and The Raven Skiway. Currently, there is a year-round station, Summit Camp, on the ice sheet, established in 1989. The radio station Jørgen Brøndlund Fjord was, until 1950, the northernmost permanent outpost in the world. 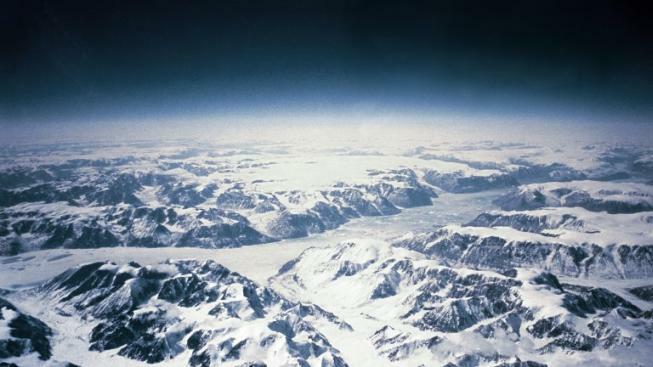 The extreme north of Greenland, Peary Land, is not covered by an ice sheet, because the air there is too dry to produce snow, which is essential in the production and maintenance of an ice sheet. If the Greenland ice sheet were to melt away completely, the world's sea level would rise by more than 7 m (23 ft) and Greenland would most likely become an archipelago. Between 1989 and 1993, U.S. and European climate researchers drilled into the summit of Greenland's ice sheet, obtaining a pair of 3 km (2 mi) long ice cores. Analysis of the layering and chemical composition of the cores has provided a revolutionary new record of climate change in the Northern Hemisphere going back about 100,000 years, and illustrated that the world's weather and temperature have often shifted rapidly from one seemingly stable state to another, with worldwide consequences. The glaciers of Greenland are also contributing to a rise in the global sea level at a faster rate than was previously believed. Between 1991 and 2004, monitoring of the weather at one location (Swiss Camp) showed that the average winter temperature had risen almost 6 °C (11 °F). Other research has shown that higher snowfalls from the North Atlantic oscillation caused the interior of the ice cap to thicken by an average of 6 cm/yr between 1994 and 2005. Scientists who probed two kilometers (1.2 miles) through a Greenland glacier to recover the oldest plant DNA on record said that the planet was far warmer hundreds of thousands of years ago than is generally believed. DNA of trees, plants and insects including butterflies and spiders from beneath the southern Greenland glacier was estimated to date to 450,000 to 900,000 years ago, according to the remnants retrieved from this long-vanished boreal forest. That view contrasts sharply with the prevailing one that a lush forest of this kind could not have existed in Greenland any later than 2.4 million years ago. These DNA samples suggest that the temperature probably reached 10 degrees C (50 degrees Fahrenheit) in the summer and -17 °C (1 °F) in the winter. 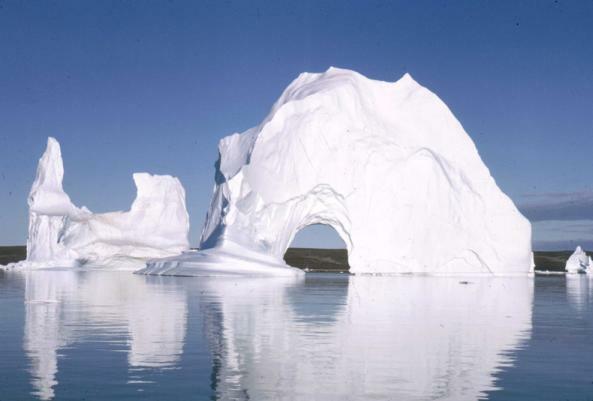 They also indicate that during the last interglacial period, 130,000–116,000 years ago, when temperatures were on average 5 °C (9 °F) higher than now, the glaciers on Greenland did not completely melt away. In 1996, the American "Top of the World" expedition found the world's northernmost island off Greenland: ATOW1996. An even more northerly candidate was spotted during the return from the expedition, but its status is yet to be confirmed. In 2007, the existence of a "new" island was announced. Named "Uunartoq Qeqertoq" (English: Warming Island), this island has always been present off the coast of Greenland, but was covered by a glacier. This glacier was discovered in 2002 to be shrinking rapidly, and by 2007 had completely melted away, leaving the exposed island. The island was named "Place of the Year" by the Oxford Atlas of the World in 2007. Ben Keene, the atlas's editor, commented: "In the last two or three decades, global warming has reduced the size of glaciers throughout the Arctic and earlier this year, news sources confirmed what climate scientists already knew: water, not rock, lay beneath this ice bridge on the east coast of Greenland. More islets are likely to appear as the sheet of frozen water covering the world’s largest island continues to melt." The name Greenland comes from Scandinavian settlers. In the Icelandic sagas, it is said that Norwegian-born Erik the Red was exiled from Iceland for murder. He, along with his extended family and thralls, set out in ships to find the land that was rumoured to be to the northwest. After settling there, he named the land Grœnland ("Greenland") in the hope that the pleasant name would attract settlers. Greenland was also called Gruntland ("Ground-land") and Engronelant (or Engroneland) on early maps. Whether green is an erroneous transcription of grunt ("ground"), which refers to shallow bays, or vice versa, is not known. The southern portion of Greenland (not covered by glacier) is indeed very green in the summer and was probably even greener in Erik's time during the Medieval Warm Period. About 81% of Greenland's surface is covered by the Greenland ice sheet. The weight of the ice has depressed the central land area into a basin shape, whose base lies more than 300 metres (984 ft) below the surrounding ocean. Elevations rise suddenly and steeply near the coast. Greenland today is critically dependent on fishing and fish exports. The shrimp fishing industry is by far the largest income earner. Despite resumption of several interesting hydrocarbon and mineral exploration activities, it will take several years before hydrocarbon production can materialise. The state oil company NUNAOIL was created in order to help develop the hydrocarbon industry in Greenland. The state company Nunamineral has been launched on the Copenhagen Stock Exchange to raise more capital to increase the production of gold, started in 2007. Exploitation of ruby deposits began in 2007. Other mineral prospects are improving as prices are increasing. These include uranium, aluminium, nickel, platinum, tungsten, titanium, and copper. The public sector, including publicly owned enterprises and the municipalities, play a dominant role in Greenland's economy. About half the government revenues come from grants from the Danish Government, an important supplement to the gross domestic product (GDP). Gross domestic product per capita is equivalent to that of the weaker economies of Europe. Greenland suffered an economic contraction in the early 1990s, but since 1993 the economy has improved. The Greenland Home Rule Government (GHRG) has pursued a tight fiscal policy since the late 1980s which has helped create surpluses in the public budget and low inflation. Since 1990, Greenland has registered a foreign trade deficit following the closure of the last remaining lead and zinc mine that year. More recently, new sources of ruby in Greenland have been discovered promising to bring new industry and a new export to the country. Air transportation exists both within Greenland and between the island and other nations. There is also scheduled boat traffic, but the long distances lead to long travel times and low frequency. There are no roads between cities because the coast has many fjords that would require ferry service to connect a road network. Kangerlussuaq Airport on the West coast is the major airport of Greenland and the hub for domestic flights. Intercontinental flights connect mainly to Copenhagen. In May 2007, Air Greenland initiated a seasonal route to and from Baltimore in the United States, but on March 10, 2008, the route was cancelled due to financial losses. Air Iceland will begin operating a twice-weekly Keflavík-Ilulissat route in July 2009. In addition to these routes there are scheduled international flights between Narsarsuaq and Copenhagen, between Kulusuk on the east coast and Reykjavík, and between Nuuk and Keflavík. Sea passenger and freight transport is served by the coastal ferries operated by Arctic Umiaq Line. It has only one round trip per week, taking 80 hours per direction. 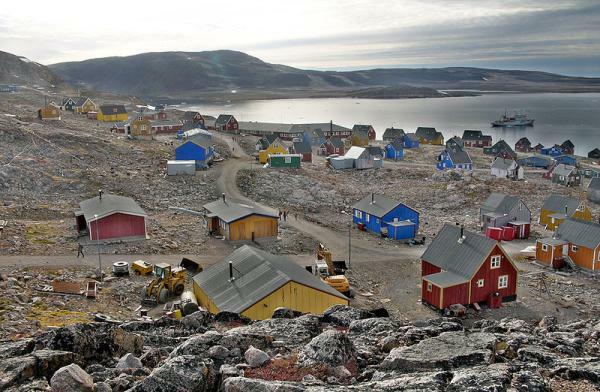 Greenland has a population of 57,600 (July 2009 estimate), of whom 88% are Inuit or mixed Danish and Inuit. The remaining 12% are of European descent, mainly Danish. The majority of the population is Evangelical Lutheran. Nearly all Greenlanders live along the fjords in the south-west of the main island, which has a relatively mild climate. Both Greenlandic (Kalaallisut) and Danish have been used in public affairs since the establishment of home rule in 1979, and the majority of the population speak both languages. Greenlandic, spoken by about 50,000 people, some monolingual, became the sole official language in June 2009. A minority of Danish migrants with no Inuit ancestry speak Danish as their first, or only, language, and Danish, which was formerly one of the official languages, now remains a language of higher education. English is widely spoken as a third language. The country has a 100% literacy rate. The Greenlandic language is the most populous of the languages of the Eskimo-Aleut language family and it has as many speakers as all the other languages of the family combined. 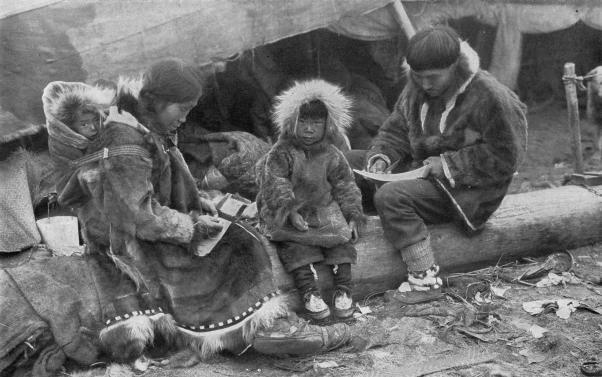 Within Greenland, three main dialects are recognized: the northern dialect Inuktun or Avanersuarmiutut, spoken by around 1000 people in the region of Qaanaaq, Western Greenlandic or Kalaallisut, which serves as the official standard language, and the Eastern dialect Tunumiit oraasiat or Tunumiutut, spoken in eastern Greenland. The culture of Greenland has much in common with Inuit tradition, as the majority of people are descended from Inuit. People continue the Inuit tradition of ice-fishing and there are annual dog-sled races. Fishing by traditional methods has been increasingly replaced by the use of firearms and modern technology. Football, also known as soccer, is the national sport of Greenland. In January 2007, Greenland took part in the World Men's Handball Championship in Germany, finishing 22nd in a field of 24 national teams. Greenland competes in the biennial Island Games, as well as the biennial Arctic Winter Games. 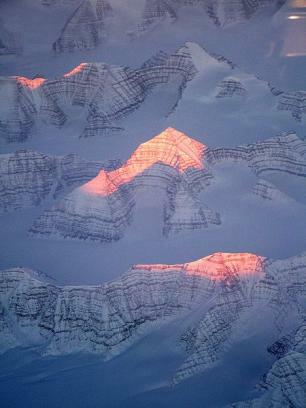 This page was retrieved and condensed from (http://en.wikipedia.org/wiki/Greenland) November 2009.